Once again I was commissioned by The Cook’s Cook magazine in the United States to write a feature article, this time on The Elephant Café. You can find the original story published in the December/January issue by clicking here, or for those with slow internet connections, I have reproduced my story below. Four months ago I moved out of my cramped open-air bush kitchen to launch The Elephant Café, a restaurant built on a wooden deck in the Zambezi River, set among a resident herd of rescued elephants in Livingstone, Zambia. Designed and built by the Explorer Club Africa, The Elephant Café sits twenty-four guests under a Bedouin tent, positioned beneath ancient riverine trees alive with native birds and vervet monkeys. Guests have the option of arriving by jet boat–a thrilling thirty-minute ride upriver from Victoria Falls, providing the opportunity to see hippos, crocodiles, giraffe and zebra–or they can travel by vehicle through the scenic Mosi-oa-Tunya National Park inhabited by wild elephants, rhinos, antelope, baboons, and other bush wildlife. On arrival, guests are welcomed to the café by the resident elephant herd and their handlers. Comprising ten elephants of varying ages, each with their own story—some were rescued from drought or were orphaned babies, others were assimilated from the wild or were born into the herd—all have grown up with safe human support using the “positive reinforcement method.” The introduction to the elephants is a special experience. To be around the elephants in close vicinity, discerning the rumble of their songs from deep within them, sensing their wildness and enormity, touches something primal and very old within. Following the elephant interaction, guests are escorted to the café’s well-appointed deck. It’s at this stage that my team of three chefs and four servers and I move in. Before sitting down to a three-course prix fixe menu, guests are offered a Wild Kir Royale, a champagne aperitif made with scarlet sindambi (wild hibiscus) syrup instead of cassis. 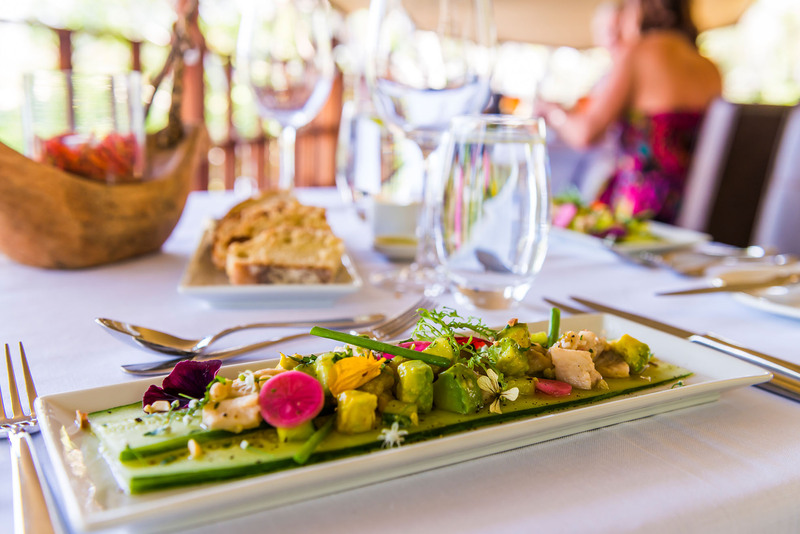 Each dish on the menu is crafted with ingredients that are locally-produced or are indigenous to the Zambezi Valley. The fresh produce we use is grown in my organic vegetable garden or by small-scale farmers servicing our tourist industry. The wild edibles are bought in Livingstone’s native markets, or are foraged from the bush surrounding our farm. It is my hope that by promoting these diverse and previously unexplored natural resources, our impoverished riverside communities will see economic growth. I develop all the recipes myself, and our menus showcase the freshest food available at any given time. The recipes are inspired by European, Asian and Middle Eastern cuisines, especially Israeli chef Yotam Ottolenghi and his team’s creative use of flavors, textures and colors. Plating with my sous chef, Aubrey Tilimboyi, at The Elephant Café. Image credit: Anthony Grote. One of my senior chefs, Adelina Banda, who lives on our farm, has taught me much about Zambian food. Our day begins in the vegetable garden picking the ingredients for the day’s dishes, as well as a selection of edible flowers, leaves, and shoots for plating. We are fortunate to be able to grow a large selection of produce most of the year round—mixed greens, herbs, squash, tomatoes, onions, aubergines, peppers, brassicas, peas, carrots, beets, edible flowers, citrus, mangoes, pineapples, bananas, strawberries—and supplement these with wild nuts, fruits, seeds, and fungi. What is noticeably absent from our garden are apples and stone fruit. It’s just too hot to grow them here. That said, I’ve found wild alternatives to replace some of these flavors. Candied sindambi, or wild hibiscus, calyxes, which we add to our Wild Kir Royale aperitif at The Elephant Café. Every Zambian with whom I work, at the restaurant or on the farm, is aware of my enthusiasm to learn about indigenous ingredients I haven’t used before. Just the other day, a young kitchen assistant, whom I employed at the café in his first job, brought me a handful of wild fruit from the market he’d paid for with his own money. “Here,” he said. “Try these. They are called masawa.” Raw, the grape-sized wild fruit hinted of apple; boiled down into a purée, masawa WAS apple. Since then I’ve showcased the fruit in one of my most popular recipes, Slow-Roasted Duck with Masawa, Ginger & Star Anise. I’ve used it in a roasted pepper soup, a gluten-free cheesecake, and it is a key ingredient in our wild fruit and nut ice cream. Wild sour plum, or mungomba, which have just come into season now. Many wild edibles grow in the bush just beyond our house. Our house is built around a massive mongongo tree, and in May each year it rains hundreds of nuts down on to our roof and floor. They are a highly nutritious annual gift from nature. We use these oily, soft nuts, similar in size to a hazelnut, in dishes ranging from biscotti, to tagines, to ice cream, to vegan mayonnaise. Not long after the mongongo nuts begin to fall from the trees, the muchingachinga fruit—colloquially known as “monkey fingers” because the bunches look like small hands—appear in the scrubby bush surrounding our garden. The blood-red fruit is sharp, almost peppery, and was once described by a visiting two-star Michelin chef as akin to licking a nine-volt battery. I use muchingachinga fruit in salad dressings, coulis, syrups and glazes. It’s versatile, interesting, and a gorgeous color. In the heavy rains of summer, from November to March, wild mushrooms begin to push their way through the soggy dead mulch left behind by the dry season. There are a number of edible mushrooms in Zambia, but here we eat chinyika, a russet and white meaty mushroom not unlike a shiitake in texture, as well as high-vis orange chanterelles called kapuipui, which are so delicate and so pretty it’s almost a shame to cook them. Many of the wild flavors we work with will never have been tasted outside of Africa. We have legumes called mbwiila, the indigenous equivalent of black eyed peas that makes a killer hummus; nsumo fruit, which when dried resemble prunes, and are perfect in a boozy wild Christmas cake. We have sour, pale pink mubuyu, or baobab, powder that I use in place of sumac; the wild sourplum, or mungomba, fruit that transforms into a superlative burnt orange ice cream; and gluten-free nzembwe, a native millet, I use instead of quinoa. Mbwiila Hummus & Melba Toast, a canapé at The Elephant Café. And while we’re busy foraging and cooking, the elephants too are contributing to the uniqueness of our cuisine. We collect truckloads of the processed tons of food they eat in a day—much of which are the same wild edibles we use in our recipes—to add to our compost heaps that help fertilize the farm’s bananas and pineapples, as well as our vegetable garden. It’s a most rewarding synergy! The article also included my recipes for Thai-inspired Tilapia Ceviche with Sesame-infused Lime, Cucumber, Pickled Radish & Avocado, featured in the banner of this post, as well as Mongongo Nut Florentines. Inji Masawa & Mongongo Nut Ice Cream with Seasonal Mulberries. Congratulations Annabel – so many discoveries and your work is utterly innovative. An inspiration as always! What wonderful accomplishments, Annabel! So hope to someday try some of your beautiful creations. Well done on a great article, you made the bush proud! Who does your photography? I am often amazed at your plating, it’s always a work of art!